Have you considered going into business for yourself but thought it would be impossible? I’m here to tell you about an awesome business idea that could allow you to make a thousand dollars or more per week. Most people have likely never considered a microgreens business or how it could transform their lives. When I started out with my business, I was not an expert grower. I had my doubts and worried I would be a failure. Instead of giving up before I even started, I decided to give it my all and see what happened. While growing microgreens might seem difficult, it is pretty simple. With a few inexpensive supplies and time, you can soon have a crop of profitable microgreens that can be sold to restaurants and individuals in your community. If you are tired of the 9 to 5 grind like I once was, keep reading and learn all you can about how to start a microgreens business so you can determine if this opportunity is the one you have been searching for. What are microgreens and how can they make you money? Maybe you’ve been to a restaurant and saw your dish served with a garnish of tiny greens or saw them being used on top of a salad. Microgreens are simply the tiny seedlings of vegetables. These tender and delicious plants have been incorporated in dishes since the 1980s, but they have recently made a huge splash in the culinary world. These tiny plants pack a big punch in the flavor department, and are filled with beneficial vitamins and nutrients. Even if you don’t decide to start selling microgreens, your health could benefit from learning how to grow a small crop on a regular basis. I want you to discover microgreens because they have the potential to help you start your own business, so you can quit your job and enjoy living your life to the fullest - creating a livelihood that you enjoy and that benefits your local community. When I started growing microgreens for profit, I was afraid it would not be a success. I was not an expert gardener, but was actually just beginning my farming journey. You may think it takes a giant “green thumb” to be successful in growing microgreens, but I am proof it does not. Microgreens farming is growing microgreens in a spare room in your home or at a commercial location. Once or twice per week, you have a crop that can be harvested and sold. You do not need an outdoor garden and you don’t even need a lot of space to run this business. I started my microgreen business with just a few flats. Starting small is the best option for beginners because it allows you to become comfortable with the process without feeling overwhelmed. It sounds cliché, but if I can do this, anyone can! If you are willing to give it a shot and put in the small amount of effort it takes to start your microgreens business, you have the potential to turn this into a great thing. Selling microgreens isn’t difficult. If you follow my tips, you will have a bountiful crop each week that you can sell to restaurant chefs, grocers, at farmers markets, and to individuals in your community. When you start selling microgreens, you might be a little nervous. But believe me when I tell you this: there is an expansive market for these delicious and nutritious microgreens. I recommend you start growing and selling radish, brassica, or pea microgreens, but there are tons more you can eventually learn to grow. Selling microgreens is not as time-consuming or as strenuous as it sounds. You’ll be surprised by how many people will buy microgreens from you, and as word spreads, your business will exponentially begin to grow. I have gone through all of the trial and error and have discovered the best and easiest methods of growing microgreens for profit. I am here to help others learn my methods so they can be as successful with much less effort. Is a Microgreens Business Right for You? You must have a little time to devote to the watering and care of your crop. You must have a small amount of money to purchase your growing supplies and initial seeds. That doesn’t seem too hard, does it? You were not asked to get a college degree, invest tons of money or spend months working on your microgreen business. That’s what drew me to this opportunity and made me want to give it my all. If you are willing to invest a little time, money and space, microgreens farming can work for you just like it has for many others. Has your interest been piqued enough to get started? Tons of people around the world are making thousands of dollars a week growing and selling microgreens for profit. I hear from people every day who have used my simple methods to start their own microgreens business. In my ebook and webinars, I detail the supplies you will need and what you need to do to ensure you start out on the right foot. If you have the right supplies and are ready to get started, you can easily begin growing a profitable crop with only a few hours a week of your time. Yes, you read that correctly! I will take you through the process and show you exactly how to start and how to keep your business going. This is not rocket science, and you do not need major training or a degree to get started. Most people are amazed when I tell them they can begin growing microgreens with a profit as high as $30 a pound. Reading my FREE eBook will teach you all the steps you need to take to get started and be successful. Within 10-14 days, you can be ready to harvest your first crop so it can be sold for profit. With each successful crop, the opportunities to make sales will grow. It is up to you how big your business becomes. Do you have 4 hours a week to spare? Do you have a small corner in your home for a growing station? Are you excited about making a profit by helping others eat nutritionally-dense microgreens? If you answered yes to these questions, it is time for you to learn more. I believe so strongly in this amazing opportunity, I am willing to share my knowledge for free. You can get started by attending my online classes, which offer extensive help. You can also download my free eBook that offers you step-by-step instruction. When I started my microgreens business, I was practically clueless. Learn from my mistakes and trial and error, and you will immediately begin seeing success. I know you are going to love your new business because microgreens are so easy to grow, they bring in such a high profit, and people LOVE THEM. You can say goodbye to the work grind and hello to a business that will give you much more freedom and time to do those things you really want to do, instead of breaking your back to make someone else wealthy. Check out my free book and webinar schedule today and do not allow this amazing opportunity to pass you by! Embrace a meaningful, fun, and profitable new business opportunity. Would you like to begin a career you actually enjoy, and that makes a meaningful difference in the world? Would you like to wake up each Monday morning excited to begin a new week because the work is so darn fun and rewarding? Maybe you should join me in becoming a Microgreens Farmer. There is no better time to get started, as this is one health food that is on the verge of exploding in popularity. Since the University of Maryland study was published finding microgreens to be 4-40x more nutrient dense than their mature vegetable counterparts, people have been seeking out reputable producers of this specialty produce item. Why shouldn't you be the one to supply them? 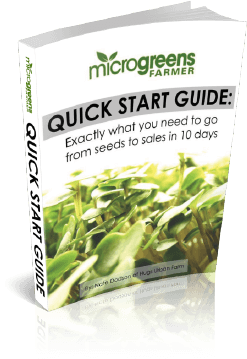 If this sounds like something you'd be interested in, please click the button below to get signed up to a webinar + receive a free copy of my popular Microgreens Quick Start Guide.